ALBUQUERQUE, N.M. — In a collaboration almost as old as technology transfer itself, Sandia National Laboratories and The Goodyear Tire & Rubber Company have worked together for 25 years to create better vehicle tires and more advanced computational mechanics. Sandia National Laboratories computer scientists Vicki Porter, left, and Byron Hanks, second from left, and Antonio Recuero, second from right, and Mohammed Sobhanie of The Goodyear Tire & Rubber Company study images of tire technology during a recent session at Sandia. (Photo by Jennifer Knight) Click on the thumbnail for a high-resolution image. The joint work allows Sandia to enhance its software toolkits and improve its capabilities for mission applications while simultaneously addressing Goodyear’s proprietary challenges. Goodyear’s engineers design every tire with Sandia-developed tools. The company credits its work with Sandia for reducing new product development times, improving manufacturing methods and lowering both technical and operational costs. 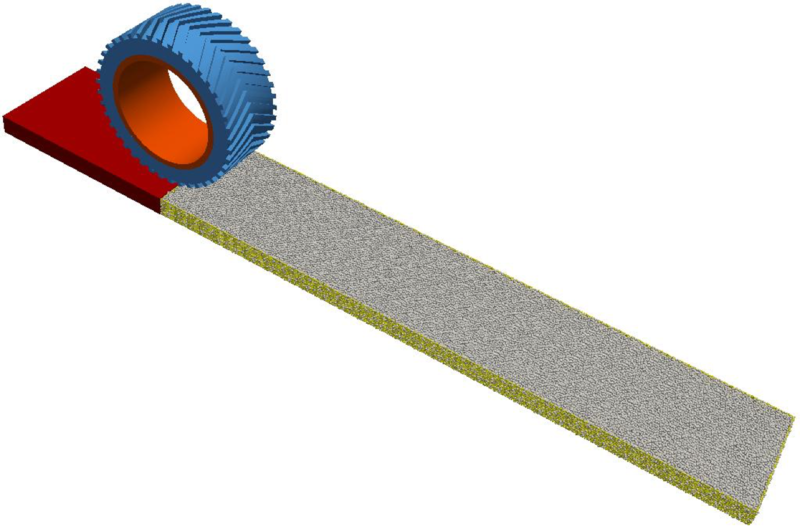 This simulation shows the detailed tread mesh of a tire. (Image courtesy of The Goodyear Tire & Rubber Company) Click on the thumbnail for a high-resolution image. Sandia and Goodyear signed a Cooperative Research and Development Agreement, or CRADA, in 1993, back when technology transfer from the national labs was in its nascent stage. In 1980, the Stevenson-Wydler Technology Innovation Act was signed into law by President Jimmy Carter, becoming the first major U.S. technology transfer legislation. It required federal laboratories to actively participate in and budget for technology transfer activities. Stevenson-Wydler was followed by the Federal Technology Act of 1986, the second major piece of legislation focused on tech transfer from federal government agencies to the private sector. It established the Federal Laboratory Consortium and let federal labs enter into CRADAs with private industry. Goodyear took note, reaching out to Sandia in 1992, and the two organizations forged a relationship through back-and-forth visits to each other’s sites. 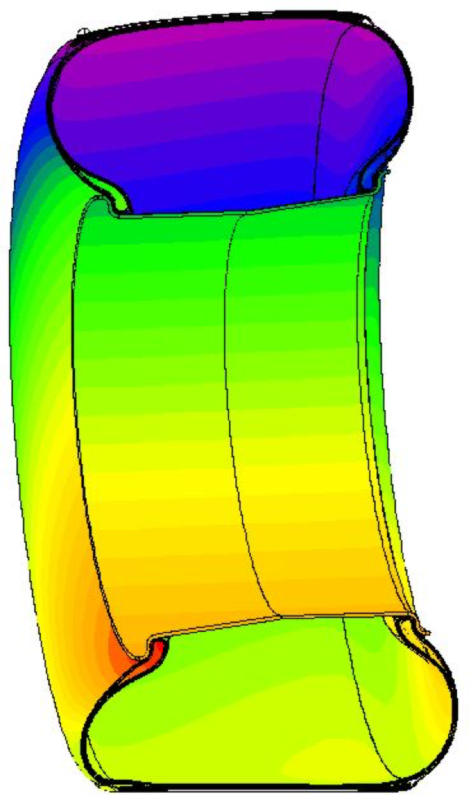 Nascar cornering design is shown in this tire simulation. (Image courtesy of The Goodyear Tire & Rubber Company) Click on the thumbnail for a high-resolution image. 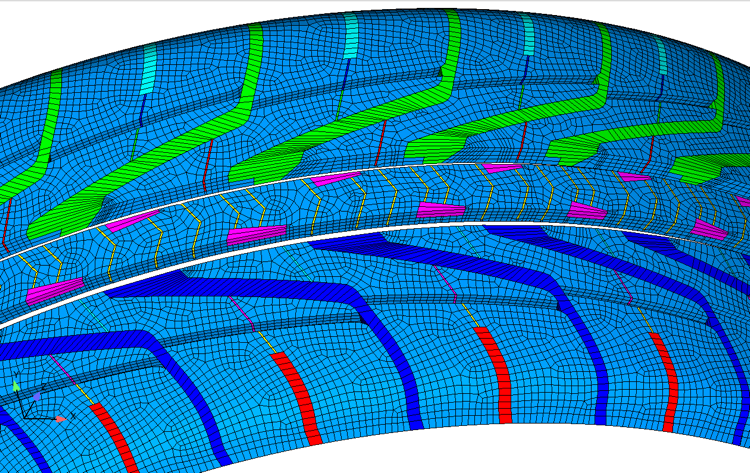 “It’s often surprising to people to learn just how complicated it is to model and simulate tire performance, considering millions of material combinations and permutations and blending structural mechanics, rigid body and fluid dynamics under varying temperature, pressure and wear conditions,” said Dale Moseley, Goodyear’s global project manager. An early victory for the collaboration was the Assurance TripleTred, a unique all-weather tire with a three-part tread compound. Goodyear wanted a visually distinctive tire that would generate buzz and demonstrate its best technology. The Assurance line was launched in 2004, and in 2005 Sandia and Goodyear won a joint R&D 100 Award for the tires, particularly the TripleTred, which was brought from concept to market in less than a year. Goodyear said the tire could not have been produced without modeling and predictive testing tools developed with Sandia. 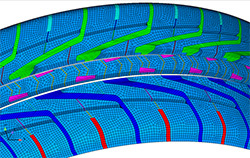 A wide range of lab technologies has played a role in the CRADA, including advanced computational mechanics, sophisticated geometry and meshing, computational simulation and verification, elastomeric materials, structural and tire dynamics, advanced manufacturing of rubber products, efficient characterization methods for structural dynamics, reliability tools for manufacturing processes, sensor systems, data science, human reliability and engineered products. 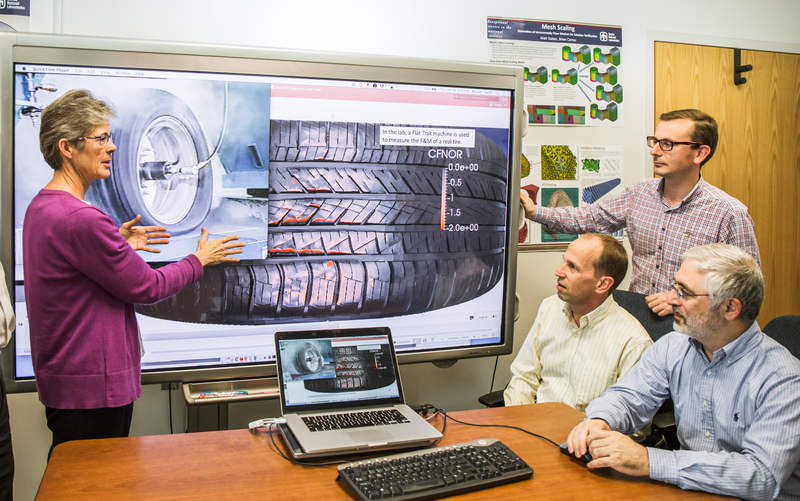 “Our relationship with Sandia has been very beneficial in our competitive success in the global automotive industry, allowing us to begin submitting ‘virtual tires’ to automakers that can be incorporated into their vehicle models early in the development process as they tune the vehicle designs,” Moseley said. A snow tire’s performance is detailed in this simulation. (Image courtesy of The Goodyear Tire & Rubber Company) Click on the thumbnail for a high-resolution image. The CRADA has been renewed repeatedly since 1993. Much research done under the CRADA has been applied to Sandia’s science-based nuclear weapons stockpile stewardship mission. The work with Goodyear led to a deeper appreciation at Sandia of the value of computer modeling in the early stages of development.